Stable Micro Systems has announced the launch of ‘Connect,’ its most sophisticated instruments yet for analyzing texture and characterizing physical properties in the food industry. The new range offers several unique technical features, including a touchscreen, a web browser interface and updated software, which allow remote and/or mobile operation, accelerate data collection and improve accuracy, according to the company. Based on Stable Micro Systems’ TA.XTplus texture analyzers, the new Connect range enables manufacturers to gain more comprehensive and accessible insights into their data, while improving user experience though increased connectivity. For users with multiple instruments, there is also an option to network all the texture analyzers during set-up, allowing data to be remotely collected via ethernet. With the ability to capture test data at 2,000 points per second (PPS), at variable rates throughout, the updated Exponent software for the new Connect portfolio offers far greater detail than has been possible in the past, detecting four times more force changes per second than previous models, which operated at 500 PPS. This makes the new texture analyzers ideal for brittle or crispy applications, such as snacks. In addition, standard engineering calculations have also been built in, helping to assess each sample’s specific moduli, stresses, strains, strengths and energies – particularly important for food packaging and other materials testing applications. 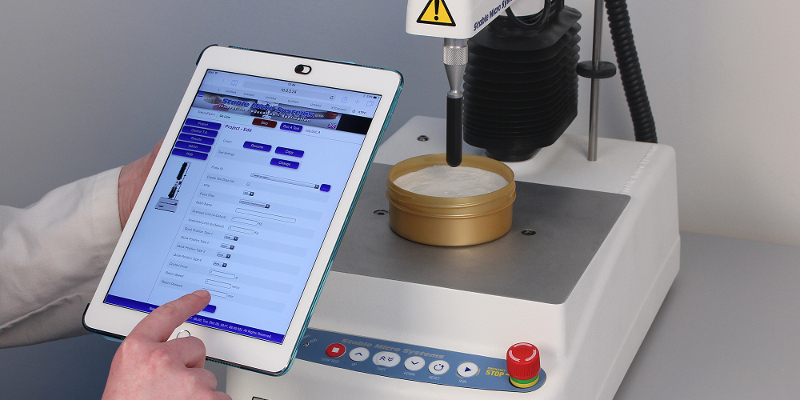 The innovative Connect line features a touchscreen, allowing users to operate their texture analyzers in a simple standalone mode. As well as the benefits of a rapid and user-friendly set-up, tests can be performed and controlled without a PC and basic results, including summary test curves, can be viewed immediately. Test files can then be stored within the instrument and uploaded to Exponent software or a USB data stick for further analysis if required. Another additional feature to the Connect range is its embedded web browser interface that enables users to set up and run tests from a PC, tablet or mobile device quickly and easily. The new interface allows test data to be temporarily stored on the instrument’s internal memory, and simply transferred when required.